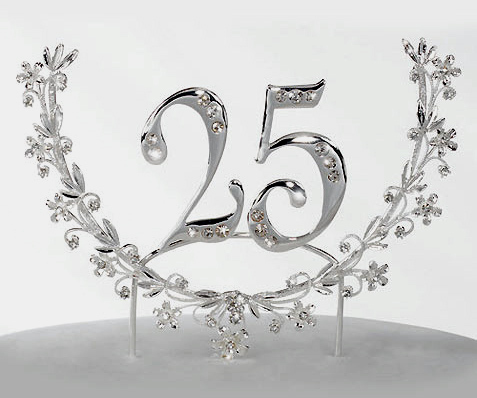 Throw a stunning 25th Anniversary Party and add the perfect cake topper that will sparkle and create a lasting impression. The 25th Anniversary Cake Decoration is 8 1/2" wide and 7" tall (not including the attached double cake picks to secure the wreath to the top of your cake). Please allow 1 week for your unique cake rhinestone wreath to ship. Our cake jewelry is non-returnable.